Wild Digital - A-Frames - Portable Street Signs. A-Frames or sandwich board signs are a great way to provide street signage for your business. A-Frames are extremely cost effective, weatherproof and very easy to transport. We sell two types of A-Frames, metal A-Frames with corflute prints and folded corflute A-Frames. A robust metal frame, portable design and easily replaceable graphics are just some of the features of this hugely popular street sign. Graphics are printed on corflute panels using our full colour, direct digital print process. 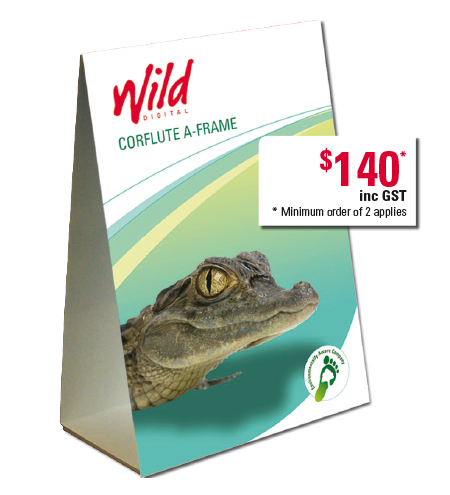 A printed corflute panel on each side of the A-Frame ensures that your A-Frame looks outstanding from both sides. You can have different images on each side of the A-Frame or the same print on both sides. Price: 600 x 600mm – $195 (inc GST). 600 x 900mm – $297 (inc GST). 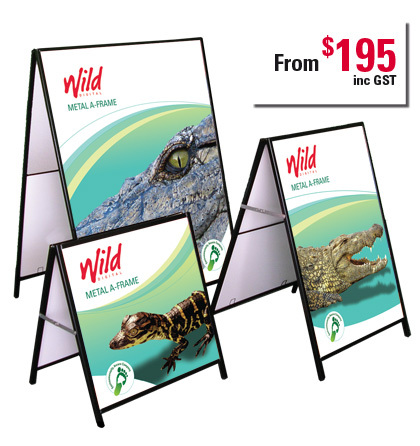 900 x 1200mm – $396 (inc GST). Price: From $140 – Minimum order of two applies.